MyPreferences Blog: Does Your Customer Experience Provide Competitive Differentiation? Does Your Customer Experience Provide Competitive Differentiation? Do you know the secrets that innovative marketers such as Microsoft and the Gilt Groupe use to deliver exceptional customer experience strategies that have enabled them to achieve unprecedented levels of new and repeat sales? You find the answers to this — and other customer experience marketing issues — at the Customer Experience Marketing Summit on September 19 and 20 in Atlanta. As one of the hosts of the event, I encourage you to attend and learn from real-life case studies presented by a powerful lineup of speakers from industry giants such as Coca-Cola, Intuit and Symantec. Ernan Roman, president of Ernan Roman Direct Marketing, author and recent Marketing Hall of Fame inductee, will provide the answers to “Does Your Customer Experience Provide Powerful, Competitive Differentiation?” Using actual Voice of the Customer research, he will explain the six key insights for unprecedented customer engagement. You’ll learn why consumers seek companies that engage them, how using customer-driven relationships creates an essential differentiator, and much, much more. Ernan’s presentation includes fresh content and case studies that have never before been presented at a conference. In the past few weeks, we’ve added new speakers and sponsors to the Customer Experience Marketing Summit. There is a wealth of information packed into a day and a half. We’ve also allowed for ample networking time to discuss ideas with your peers. 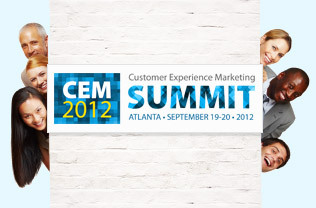 I encourage you to visit the Summit web site at www.cemsummit2012.com for more details on the agenda and speakers. Also, we’re partnering with many trade associations who are offering registration discounts to their membership base. To see if you qualify for a discount on registration, contact cemsummit@possiblenow.com. Be sure to take advantage of our Early Bird rates which expire at the end of the month. I hope to see many of you at the CEM Summit this September! Feel free to follow the CEM Summit on Twitter @cemsummit.